The Principality of Monaco is a real estate market like no other. At just over two square kilometres in size, land is at a premium – to such an extent that an ambitious offshore extension project is currently underway that, once completed in 2025, will add six hectares to its territory. Add to that Monaco’s reputation for economic and social stability, and it’s unsurprising that real estate here is some of the most sought after, and expensive, in the world. Monaco is comprised of eight defined districts, each with a distinct personality. If you are interested in buying property in Monaco, we’ve combined expert insider knowledge from leading Monaco real estate agents Miells & Partners with hard data recently released by IMSEE (Monaco Statistics) to compile this guide to help you decide which neighbourhood is best for you. For many, Monte-Carlo is a synonym for Monaco but it actually denotes the district in the centre of the Principality. Monte-Carlo is home to an incredible concentration of Monaco’s iconic attractions, from the Monte Carlo Casino to the luxurious Hôtel de Paris and its three Michelin-starred restaurant Le Louis XV – Alain Ducasse. An energetic neighbourhood with commerces and restaurants, the Metropole Shopping Centre and Buddha Bar are of particular note. Within Monte-Carlo, the Carré d’Or is the ‘golden square’ of Monaco property. Looking towards the future, One Monte-Carlo and 26 Carré d’Or are two particular developments of note that are nearing completion and promise to further enhance the vibrant real estate landscape. The 2016 census revealed that 22 percent of the population live in Monte-Carlo, making it Monaco’s most populated district. In figures released by INSEE (Monaco Statistics), more than a quarter of property transactions last year took place in Monte-Carlo, while the average price per square metre was €44,094, which, apart from the special nature of Larvotto (see below), made it Monaco’s most expensive district. At the eastern edge of Monaco, waterfront Larvotto oozes exclusivity. Luxury residences line avenue Princesse Grace, sharing the seaside promenade with five-star resorts including the Monte-Carlo Beach and Monte-Carlo Bay Spa and Resort. Along with having Monaco’s Larvotto beach at your doorstep, other important addresses here are iconic nightspots Jimmy’z Monte-Carlo and Sass Café as well as the Principality’s conference and exhibition centre, the Grimaldi Forum. The private members club 39 Monte-Carlo is a recent addition to the neighbourhood and its gym and wellness philosophy is favoured by elite sports stars and discreet locals. Only five percent of Monaco residents call the district home. In a testament to just how rarely property in Larvotto enters the market, only five real estate transactions were concluded in 2017 with an average price per square metre of €70,290, although INSEE notes that this figure is significantly higher than the Monaco average due to the limited number of transactions and exceptional nature of properties sold. 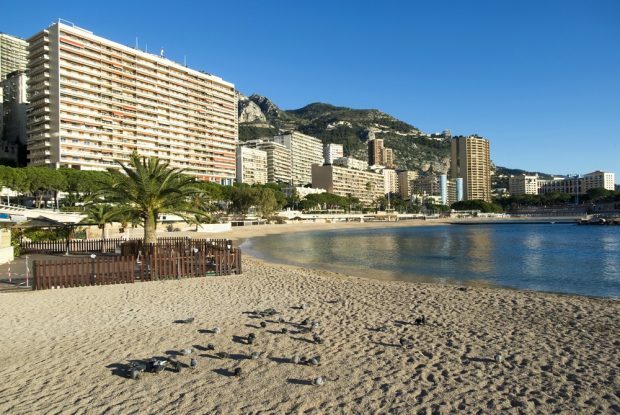 Palais de la Plage is a development currently in construction which will add 12 prestige apartments to the neighbourhood and the ambitious Monaco land extension project will change the face of Larvotto. Fontvieille has a pretty harbour lined with excellent restaurants and is located to the west of the Principality, where Monaco meets France’s Cap d’Ail. Although it is a busy commercial area, with a large Carrefour supermarket, the neighbourhood is also considered to be a quiet and family friendly choice of residence. Monaco’s small but captivating Zoological Gardens are here, while Fontvieille Park has ducks, ponds and playgrounds and the Princesse Grace Rose Garden is an oasis of calm. Monaco’s heliport is in Fontvieille and helicopter transfers connect the Principality with Nice Côte d’Azur Airport in seven minutes. Arguably Fontvieille’s most dominating architectural feature, however, is Stade Louis II, the home ground of AS Monaco football club. According to the 2016 Census, 12 percent of the population call Fontvieille home, predominately in modern residences at the water’s edge. The average price per square metre in 2017 was €42,575. Centred around Port Hercules, Monaco’s main harbour (and starting grid of the Monaco Grand Prix), La Condamine is at the heart of Monaco. Luxury yachts berth here year round, while the recently completed Yacht Club de Monaco, designed by Norman Foster, is an eye-catching design. From casual bistros to upscale restaurants, there is no shortage of dining options in this neighbourhood, although La Condamine locals are more often than not found enjoying a coffee and chat at Place d’Armes, which also hosts a daily produce market. Thanks to its central location, La Condamine is a transport hub and is well connected to both the train station and local and regional buses. The International School of Monaco is also situated here. ‘Le Stella’ is a recently completed development that has generated a lot of excitement on the Monaco real estate scene. La Condamine is home to 14 percent of the Monaco population and the average price per square metre in 2017 was €37,459. Also known as ‘Le Rocher’ (the Rock), a reference to its dominating position in the Monaco landscape, Monaco-Ville is the historic heart of Monaco and a heritage district characterised by pedestrianised alleyways and traditional restaurants. Visitors are drawn to this neighbourhood by the Prince’s Palace at one end and the Oceanographic Museum at the other. In summer the Monaco Open Air Cinema boasts one of the most spectacular outdoor settings in the world. While many buildings in Monaco-Ville house government offices, nearly 500 principal residences were declared in the 2016 census. Typically, property here retains a historic charm. Monaco-Ville may contain a large concentration of Monaco’s tourist attractions but it houses the smallest population of all of Monaco, three percent to be precise. INSEE did not have enough data to calculate the evolution of price per square metre in Monaco-Ville in its recent report. A predominately residential district with an elevated position at the northeastern edge of the Principality, La Rousse it has a concentration of luxury apartments with uninterrupted sea views across the beach at Larvotto. The stand out construction is the Tour Odéon which was completed in 2015. An incredible 170m high, with a five-storey penthouse that is billed as the most expensive in the world, it is the tallest building in Monaco. Monaco residents who choose to live in La Rousse have the sporting facilities of the Monte Carlo Country Club at their doorstep. The venue also hosts the highly anticipated Monte-Carlo Rolex Masters ATP tennis tournament every summer. La Rousse is home to 19 percent of Monaco’s population, making it the second most populated neighbourhood. In 2017, the average price per square metre here was €37,247. Jardin Exotique is a primarily residential district in the northwestern corner of Monaco that shares its name with its star attraction, the terraced botanical gardens that offer superb views across the Principality and out to the Mediterranean Sea. Another green space, the Princess Antoinette Park, is popular with parents of young children while the neighbourhood is also home to Monaco’s hospital, Centre Hospitalier Princesse Grace, and the New National Museum of Monaco – Villa Paloma. The 2016 Census puts the population figure of Jardin Exotique at 14 percent, while in 2017 the average price per square metre was €34,915. Conveniently located next to the main train station in Monaco, Les Moneghetti is an elevated district in the north of the Principality with sweeping views out towards Port-Hercules and Le Rocher. This low-key neighbourhood is built on terraces and it’s not uncommon to stumble upon elegant Belle Epoque villas as you explore off the beaten track. The name, Les Moneghetti, means ‘little Monaco’ in Monegasque and the area is known for its residential nature, yet its situation between the Jardin Exotique and Monte-Carlo means the advantages of city living are never far away. The neighbourhood boasts 11 percent of Monaco’s population. The average price per square metre in 2017 was €31,302.